How did we ever live without the Dummies Guides? Like the internet and mobile phones, Dummies Guides have become part of the information age. Whether you want to know how to plug in your Blackberry or want to make blackberry jam, you'll be sure there's a book all about it. (Actually we checked but Blackberry Jam making for Dummies does not exist, sorry). Are they just patronizing dumbed-down pulp non-fiction, or actually seriously helpful guides in a technically confusing but ultimately exciting world? 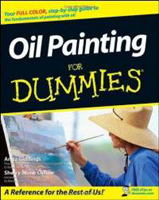 No1Reviews.com takes a look at Oil Painting for Dummies by artists Giddings and Clifton. The guide begins with a thorough introduction to the book itself. Dummies Guides are designed to be fun so the style is informal and accessible. The reader is briefly advised on how to make the best use of the text itself by being aware of how important information and instructions are highlighted in the book. It is meant to be a comprehensive guide, so there is a lot of information and here you learn how to navigate through, skim read and ignore superfluous text while getting straight to the nitty-gritty. There are nineteen chapters in this book and a good index, so it ought to get you off to a good start. However, you might start by skipping the boring intro anyway. The information and layout are easy to use, so the reader can move on and progress quickly. After a short introduction discussing possible motivations of painting in oils, there is a section explaining the medium of oil paints. This is a practical guide and meant for the complete beginner. Dummies guides tend to be in black and white print, so you may find the black and white pictures less than inspiring. But at the end there is a whole chapter on ten artists from art history to inspire you. There is absolutely no substitute for going to a gallery and seeing the real thing, so this book encourages the painting student to do just that, and the learning effect is far better than a bunch of glossy pictures in a book. Before you even dip the brush, Oil Painting for Dummies walks you through the painting process in brief. Then, there is a study in black and white so that you can get the feel of the paint and brush and how they behave on the canvas. There does not appear to be a chapter on drawing, so the focus is completely on Oil Painting. Presumably you are required to buy the Dummies Guide on how to draw first! There are two chapters on painting people, which could be a tricky subject, but a popular one (if you can get anyone to sit still long enough for you). Landscape and still life are also in there, but because this is a technical book, most of the emphasis is on getting to grips with the medium first rather than expanding your subject base. There is some good advice on planning your painting, composition, communicating ideas visually and mixing colors. This guide would be a good place to start, but perhaps not a course in itself. The student will be able to move through the chapters swiftly as they are concise, effective and encourage progression. The Amazon.com price is good value, but if you are a complete beginner artist you may need some other books to help you with drawing technique. Chapter 18, Ten Strategies to Immediately Improve Your Painting is a useful resource and will give you something to work on after you have got your first results. Oil Painting for Dummies is a recommended beginner's technical text book as part of a wider reading learning programme. On Dummies.com you will find lots of useful video guides from the For Dummies experts.